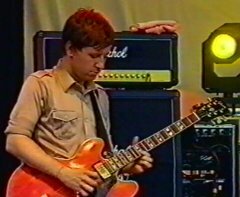 Mark Webber (born 14th September 1970) is a guitarist. He is most famous for playing in Pulp (since 1995), and appearing on all of their albums since their Mercury Music Prize winning collection Different Class. Webber was originally the secretary of Pulp's fan club. Since Pulp disbanded, Mark has travelled the world creating and presenting avant garde films. He also curates the annual Experimenta weekend at the BFI Southbank as part of London Film Festival. In late 1998, Webber remixed a track for Thurston Moore's album "Root" (released in January 1999) which was a multimedia project composed of 25 one-minute guitar pieces improvised by Thurston Moore of Sonic Youth. These samples were sent out to around 100 people - both visual artists as well as musicians - in Hoover bags to remix or create accompanying artwork for. The results were then released. (Source: Wikipedia). Mark's track, eventually lasting 2:28 is number 7 and is vaguely reminiscent of the intro to Seductive Barry.